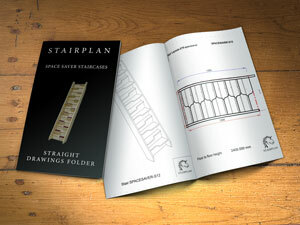 Staircase Plans - Use these folders find the closest plan to the stair layout you require. We offer a full range of straight staircases. All made to measure. we offer a full selection of staircase widths and floor to floor heights. Find a plan close to what you require and call us for a quotation. 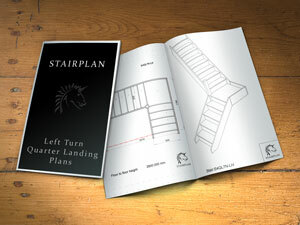 A selection of plan layout drawings for quarter landing staircases. These designs are as a guide to help us work out the design you require. All sizes are fully customisable. A range of single turn 3 tread winder staircase designs. These designs are as a guide to help us work out the design you require. A selection of Loft winder staircase layout plans drawn to the minimum stair width suitable for access to loft conversions with a single bedroom. A selection of typical double turn winder staircase layout drawings. Drawn here to a standard width and floor height. For properties with a little more space than usual these double turn quarter landing staircase drawings can be the basis for a great staircase. Staircases with a landing detail as per the image above are known as a Half Landing staircase, we have a selection of half landing stair plan dawings available. At Stairplan we have a passion for quality - Come and see our staircases at the showroom. Home | Stairs | Stairparts | Terminology | Workshop |Staircase Plans | Jobs at Stairplan in Telford | Visit the Showroom..